it's a good way to move by height from smaller to taller and leave bulky and big components for the end. Cyrix200+ wrote: Resistance is futile! HOLY CAP! That's a lot of capacitors. All of a sudden I'm getting there! Time spent soldering so far: 5.5 hours of fun. Awesome. I will nevertheless try to manufacture one bracket next week. Volume wheel slot will be the hardest. Last edited by root42 on 2019-3-24 @ 12:01, edited 1 time in total. Wow if we can get a production run of these it would be awesome! Almost done! Still have to program the microcontroller, and the YM3812 and NE558 are still in the mail. That looks awesome! Hope to hear this in action when its finally assembled. How long time did it take in total so far? Eight hours of assembling, in three evenings. My technique was a lot quicker in the end, it was also a learning experience for me. I also spent a few hours reading the docs, ordering parts and learning how KiCad works. -- edited a dumb autocorrect. it took EIGHT hours, not RIGHT hours. Last edited by Cyrix200+ on 2019-3-25 @ 08:24, edited 1 time in total. Very nice work Cyrix200+! I worked on my own board this weekend, but I am battling to get a few parts - the NJM3403A and the audio jacks are proving to be the most difficult. I managed to get an NE558 from another sound card, the sound chips from eBay and all the rest locally - but finding the exact audio jacks locally seems impossible - and the only NJM3403A chips available locally are surface mount. It does take hours though - spent at least 2 hours yesterday building my board and I guess there is at least another few hours of work ahead before I have a working board - not to mention weeks of waiting for overseas deliveries. It's very rewarding though to just sit and work though a project like this however. AnacreonZA wrote: Very nice work Cyrix200+! I worked on my own board this weekend, but I am battling to get a few parts - the NJM3403A and the audio jacks are proving to be the most difficult. 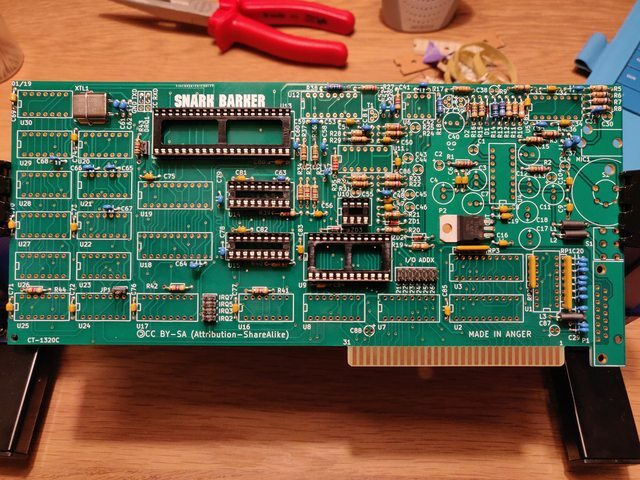 I managed to get an NE558 from another sound card, the sound chips from eBay and all the rest locally - but finding the exact audio jacks locally seems impossible - and the only NJM3403A chips available locally are surface mount. It does take hours though - spent at least 2 hours yesterday building my board and I guess there is at least another few hours of work ahead before I have a working board - not to mention weeks of waiting for overseas deliveries. It is very rewarding indeed. I ordered everything at Mouser (except the NE558, TEA2025B, YM3812, YM3014B and SAA1099), using the BOM, you could probably do that of Mouser delivers in your area. At least shipping to Germany is free on Mouser orders over 50 EUR. One can usually achieve this by bundling projects in one shipping. Digikey might be another option to order from, but they also have shipping fees. Thanks - I think I'll try mouser. Apparently there is a South African mouser site, but I think I'll use my Aramex Global Shopper address instead just to be safe. 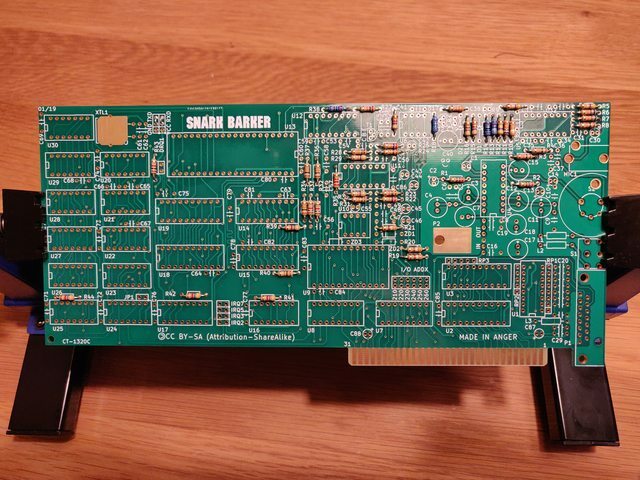 Is there any reason to use ceramic fiml caps resistors instead of metal film ones on the Snark Barker and Adlib cards? Cyrix200+ wrote: A TL866CS should be able to flash it, right?